The design of La Monacilla Golf Club, by Mr. Jose Maria Olazabal, features fairways with subtle shapes and slopes and large, well protected greens.The course design fits perfectly with the natural shape of the land and this, allied to the quality of the golf holes, means that La Monacilla is a great golfing challenge for players of all handicaps while still maintaining the beauty of a natural woodlandA feature of the design are the six tees on each hole, allowing each golfer to choose the layout that best fits to their level of play. 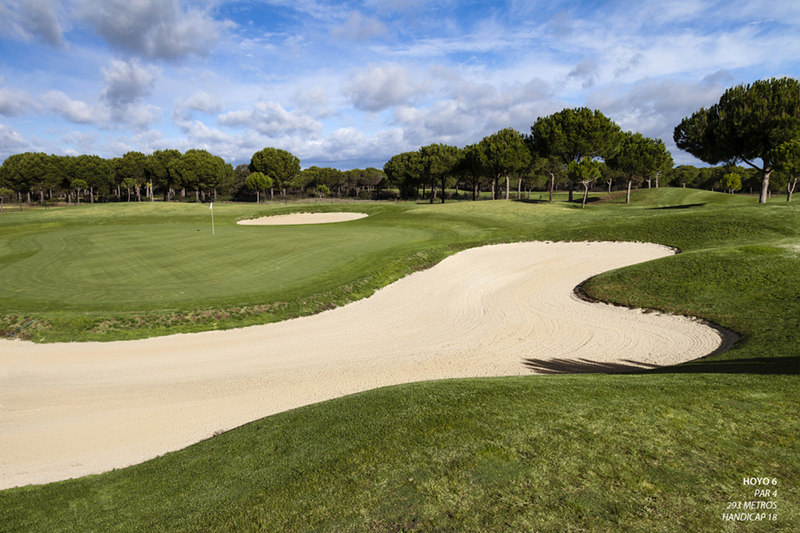 The strategic placement of the fairway bunkers means that each tee fits perfectly to the hole layout making the course an enjoyable challenge for golfers of all abilities.The result of this fabulous golf arquitecture, combined with the superb course maintenance and the wonderful weather conditions found in the Huelva province, is a paradise for golfers. 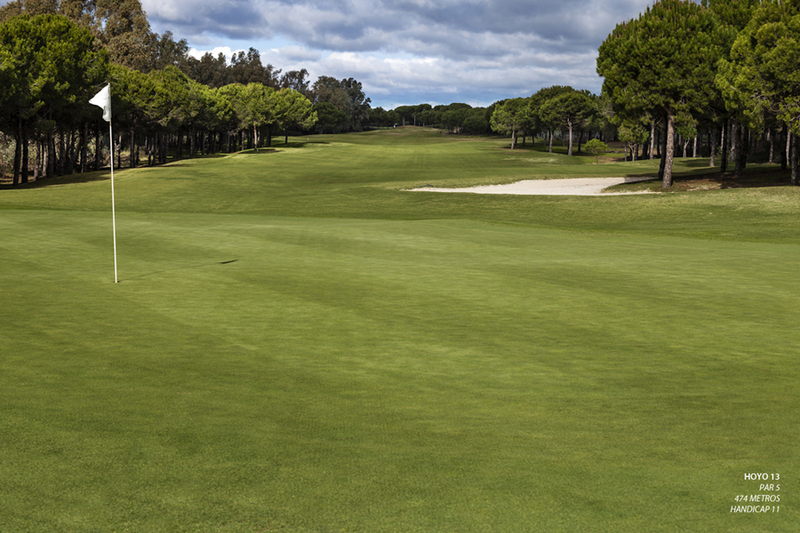 La Monacilla, according to golfers themselves, is the reference point for great golf in Eastern Andalucia. 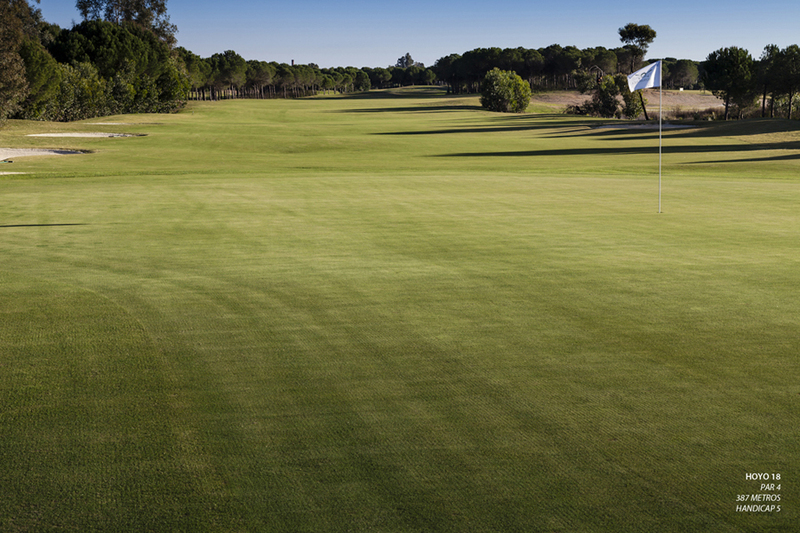 With more than 3000 hours of sun and an average temperature of 18º in Huelva, La Monacilla is located in the perfect area for the practice of golf where play is available every month of the year. 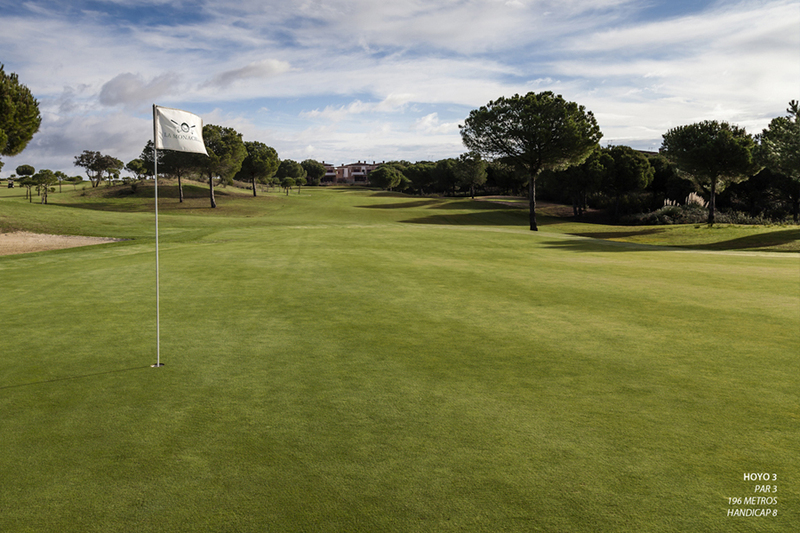 In conclusion, La Monacilla is a great experience for passionate golfers. Download the SLOPE LA MONACILLA MENS OR SLOPE LA MONACILLA LADIES and Scorecard. Download the golf hole description clicking here. A short par 4 with a wide fairway where long hitters could go for the green. The difficulty of this hole is in the 11 bunkers situated around the green. In order to lay up off the tee it is best to use an iron to avoid the well placed fairway bunkers. A hole where accuracy is well rewarded. Tee Negras 298 m. 328 yds. Tee Blancas 284 m. 312 yds. Tee Amarillas 273 m. 300 yds. Tee Azules 259 m. 285 yds. Tee Rojas 224 m. 247 yds. The prime danger on the second hole is the lake that is situated all the way down the left side of the fairway. Another lake sits just in front of the tees although it requires only a short carry to reach the fairway. This short par 4 has a small green protected by two bunkers. A long and difficult par 3 which, for most players, will require a driver or 3 wood off the tee. The sloping green is well protected by a bunker short right and a steep runoff area to the left. A spectacular hole where the true beauty of the course becomes apparent. 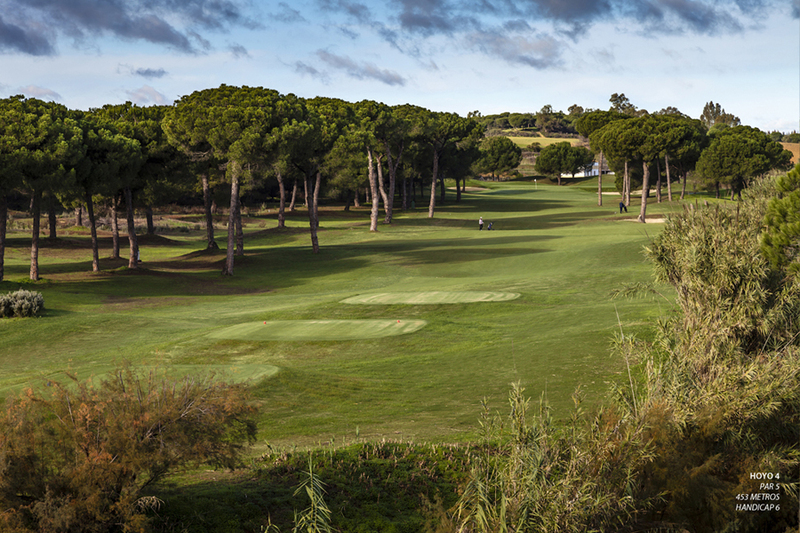 From the tee perched on high there is a wonderful view of this superb snaking par 5. A water hazard runs down the right of the hole in a tree filled valley while the left of the fairway is well protected by tall trees and out of bounds. The green is framed by two large bunkers, one on either side. A par 4 played uphill between a water hazard on the right and out of bounds on the left all the while framed by the tall pines on either side. 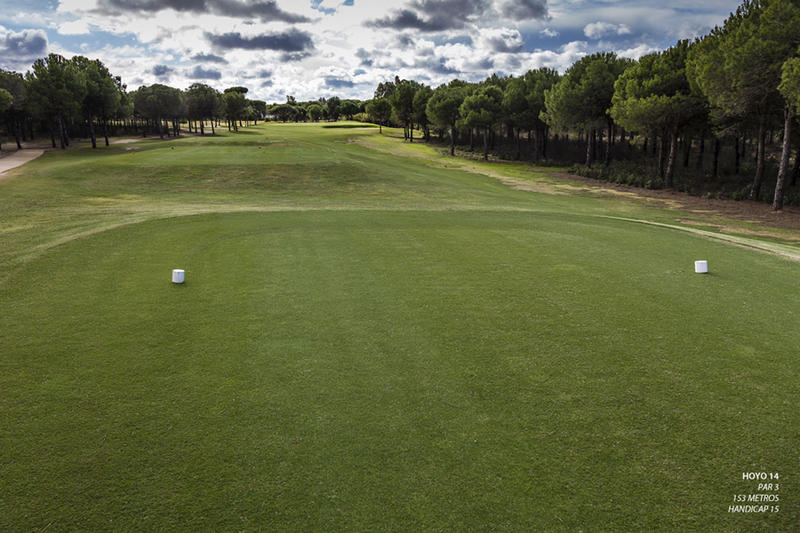 The fairway slopes to the right, so it is best to aim slightly down the left of the fairway. 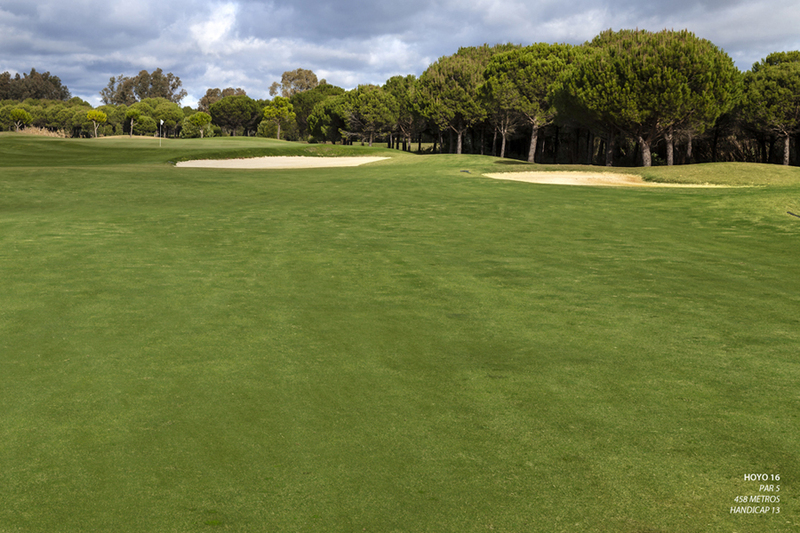 The green is raised and has a large and difficult bunker at the front making club selection vital. A short 4 par designed to provide respite after the tough preceding holes. 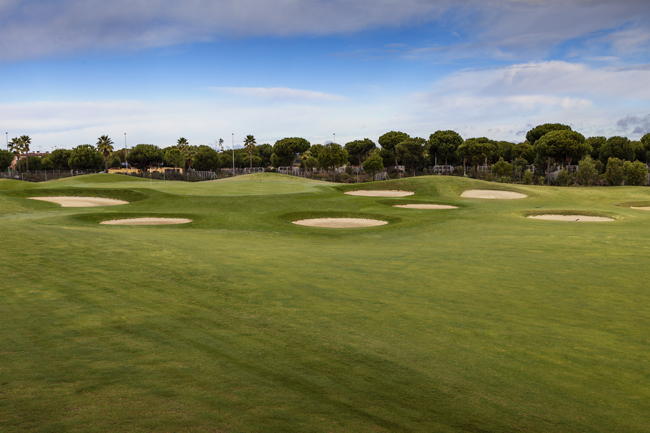 It features a slight right to left dogleg with two fairway bunkers and two greenside bunkers. 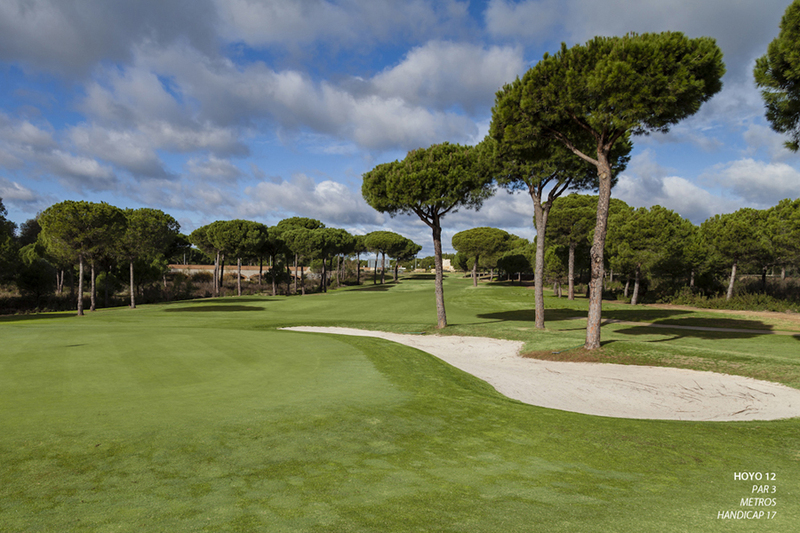 Big hitters could carry the pine trees on the dogleg to reach the green, while others should lay up short of the fairway bunkers leaving a short iron to the green. 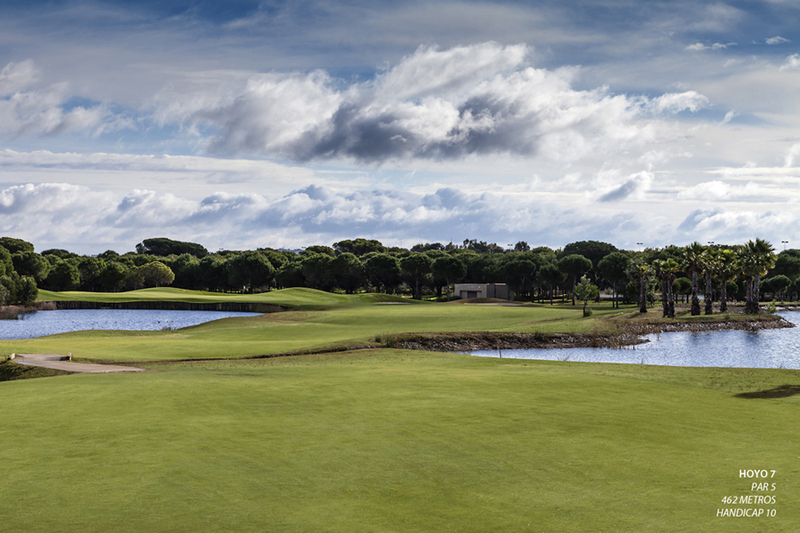 The signature hole of La Monacilla. A beautiful par 5 divided in two by a stream which connects the lakes which sit on either side of this hole. The drive is played short of this stream, and the lay up over it and onto the next part of the fairway also protect by water on the left side. If the first two shots are well handled, it will leave a short shot onto a green protected by water short, and a bunker long. A par 4 with a right to left dogleg. There are two bunkers on the left side of the fairway which have to be avoided from the tee. 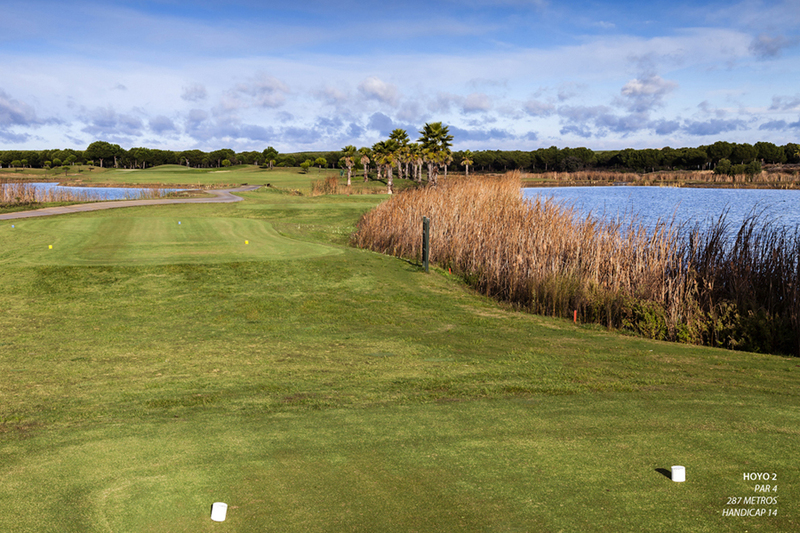 The fairway is wide, but the drive should not be struck too far to the right to avoid the bunkers, as there is a small stream which runs up the right side of the fairway. The green is slightly raised and has a bunker short left and another at the back. A long and difficult par 4 this time featuring a left to right dogleg. The hole is framed on either side by dense woodland and a stream down the right side. Two huge bunkers wait on the left for any errant drive straying away from the danger on the right. For the long second shot, there is a greenside bunker short right. A medium length par 3 where it is best to play slightly towards the right in order to avoid the bunker which sits short left of this green. The green is large with two platforms which might mean a long putt with a difficult read. A straight par 4 requiring accuracy from the tee and the fairway. 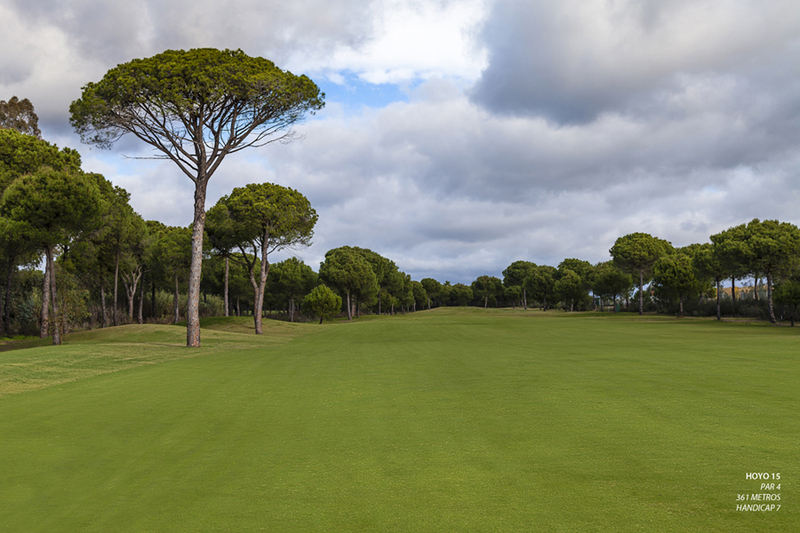 The woodland encroaches into the fairway at the distance of a good drive with a bunker also sitting on the left side of the fairway, meaning that the best tee shot should be played short of this trouble. The green is wide with bunkers short left and short right making club selection vital. 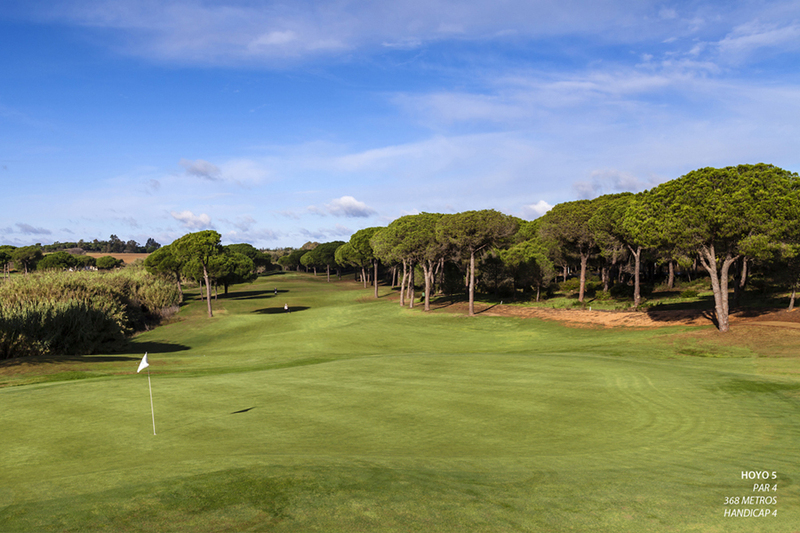 A short par 3 which has as its main defense the large bunker and pine trees on the left of the green. The green is large and fairly flat, which should leave a makeable putt. A par 5 beautifully framed on either side by dense woodland. Two huge bunkers are on the left of the fairway, so the drive should be played down the right side. The second shot however should be played down the left of the fairway to avoid the stream the runs down the right towards the green. Watch out though for the large fairway bunker 50m short of the green. A par 3 where the main challenge is to avoid the large bunker short right of the green. The green is large with two platforms and unless the ball is on the correct level it will be a complicated two putt. The tight driving line on this Par 4 requires accuracy to avoid the bunkers and out of bounds on the left of the fairway and the tall trees and stream that run down the right. The green is well protected by two bunkers on the left and a steep runoff area on the right, although it is best to stay to the right on your approach shot. Behind the green there is dense shrubbery which will make getting up and down very difficult. A Par 5 where longer hitters can reach the green in two shots. The fairway runs in a right to left dogleg, from the tee framed by woodland on the left and 2 bunkers on the right. If the fairway is found from the tee, the green, raised and with a bunker short right, can be attacked for a good result on this hole. The most difficult hole on the course, this long and tight par 4 has a pronounced left to right dogleg. The tee shot should be played down the left in order to avoid the dense woodland and water hazard that runs all the way down the right, but avoiding the three bunkers that sit on the left of the fairway, providing a perfect aimline for a faded tee shot. The large green is well protected by bunkers short right and left. A beautiful and challenging hole. This par 4 is a fine finishing hole. The fairway runs straight but is protected by a dense woodland on the right and well placed bunkers all the way up the hole meaning accuracy is a priority. The long shot second shot is to a sloping green well protected and framed by two bunkers.